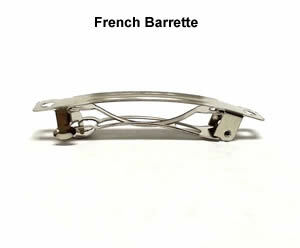 French Barrettes or Alligator Clips can be attached to any 3/8", 5/8" or 7/8" bow(s) of your choosing. 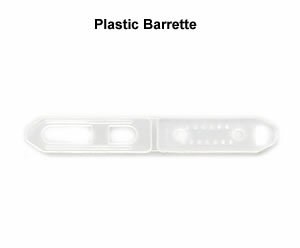 For your furbaby's safety, BowBiz bow backings are securely attached and are not removable or interchangeable. You have the option of choosing a different backing for 3/8", 5/8" and 7/8" bows from the selections below. NOTE: Backings cannot be added to baby boutique bows, petite boutique bows or mini velvet bows (due to their small size). HOW TO HAVE BACKINGS ATTACHED TO YOUR BOWS ... It's easy! 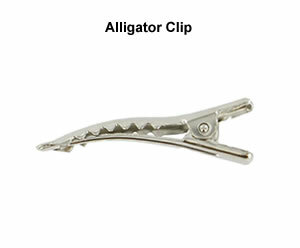 Simply add barrettes or clips (to match the bows you want them on) to your shopping cart. 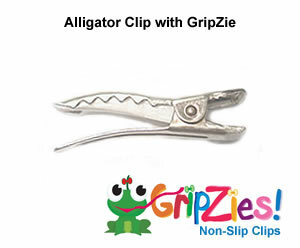 For instance, if you are buying 8 bows and would like clips on them, then you would add 8 clips to your cart as well. When the number of bows ordered matches the number of backings ordered, I assume you want them attached and automatically do so for you. Not sure of what backing is best for you? See our Bow Training Tips page for information on bow backing selection.